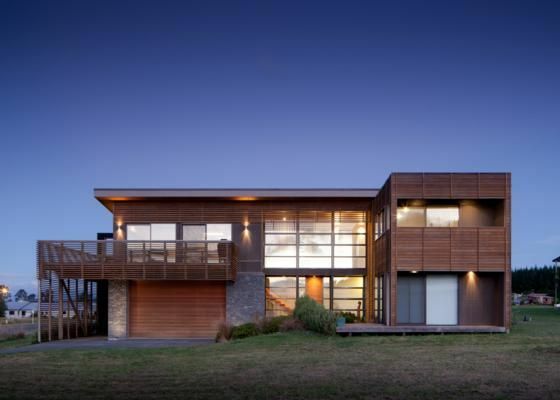 A modern holiday home in Motuoapa near the southern end of Lake Taupo. Ideally located 25 minutes south of Taupo, 45 minutes from Whakapapa skifield, close to numerous trout fishing rivers and 500m from the Motuoapa marina and boat ramp on Lake Taupo. This fully furnished 2 storey house has all the features to make your holiday a great one such as continuous gas hot water, master bedroom ensuite with twin shower heads and a spa and sauna. Relax on the large decks and enjoy views of the lake, or by the gas fire on leather recliner sofa's. There are plenty of activities available, such as table tennis in the games room, board games, DVD player and SKY TV, and tennis, netball, basketball and petanque courts directly across the road. There is a park at the back of the house with a playground and numerous bush and riverside tracks to walk or mountain bike. The house is family friendly with a portacot, highchair, toys, books, and small table and chairs, a safety gate on the stairs and nightlight in the kids room. The games room has a fold-out sofa bed which makes up into either 2 singles, or 1 super-king bed. It also has a spare single mattress, enabling it to be used as a 4th bedroom - ideal for 2 families to stay. Pets may be able to stay - only by prior arrangement. Please be advised that we have a MethMinder silent monitored alarm and watchful neighbours. Top and bottom sheets, pillow cases, bath towels, tea towels, 3x hand towels, 2x bath mats. Smoking allowed outside only using the ashtray provided. Check-in from 4pm, Check-out by 11am. Large groups of adults not accepted (top bunk beds suitable for kids only). Loved our stay. Had an amazing time. Was a great team retreat for our 2019 pleasing session. Thank you so much for having us. Walking distance to cafe and lake. Great for families. Great location with views of the lake. Loved the house and the location. Plenty of room for the boat, and well set up for guests! Beautiful house in a beautiful location. Had everything we needed for a great family holiday. Would definitely book again. Wonderful home and facilities. Such a great place to unwind after a day in the snow!